With engines producing upwards of 800 horsepower, these 1200 pound rocket ships combine the thrill of raw power with the heart stopping action of non-wing sprint car racing. Dirt rooster tails, wheel stands and three wide racing are the norm when these bad boys come to town. Sprint cars also run on paved tracks and any driver with aspirations of a championship must be able to negotiate both dirt and pavement. "I think the most challenging racing for a driver is Sprint Car racing on short dirt tracks. When you get a powerful sprinter on a short dirt course you've really got your hands full". "Sprint Car racing is one of the most exciting forms of racing to watch in the world"
Sprint cars are powered by 410 cu. in. V-8 engines with aluminum blocks and cylinder heads specially prepared for racing. USAC Western States sprint cars have a maximum of 360 cu. in. These engines use fuel injection and methanol for fuel. Sprint car races are normally held on 5/8 mile and smaller tracks; however, they sometimes make appearances at the 1-mile ovals. Some of the highlights on the USAC Sprint Car schedule are the "Little 500" at Anderson Speedway, the "Tony Hulman Classic" at Terre Haute, "USAC's Indiana Sprint Week", and the "4 Crown Nationals" at Eldora Speedway in Ohio. Normally aspirated, internal combustion, four cycle, piston type V-8's. 410 cu. in. Fuel, 28 gallons minimum Oil, 11 quarts avg. Fastest official recorded lap average is 144.167 mph set by David Steele at Phoenix International Raceway, January 18, 1998. 84 inches min., 90 inches max. Aluminum, 15 inches in diameter. Right rear 18 inches wide, left rear 14 inches wide. Front wheels 10 ins. wide. Direct drive without clutch or transmission. Quick change gears are behind the rear assembly. 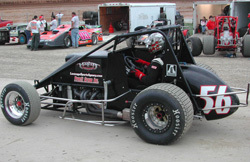 A typical sprint car costs between $50,000 and $60,000 and most teams have a separate car for pavement and dirt tracks.